I made these beans several days ahead of the day we made apple juice as a family. if you think there is too much sugar, reduce it to your taste. Place crumbled ground beef and sausage meat in a large roaster. Fry bacon until crisp, remove from pan and add chopped onions and celery. Place beans and corn, bacon, onion celery and peppers in large casserole. Mix sauce ingredients in a large bowl. Pour sauce over bean mixture and stir to combine. Cover and bake for 2 hours in 350˚ F oven. Remove lid for the last 1/2 hour. Serve with Patty's Oriental Salad (http://www.mennonitegirlscancook.ca/2010/01/pattys-oriental-salad.html) or Apple and Cabbage Coleslaw ( http://www.mennonitegirlscancook.ca/2012/01/apple-and-cabbage-cole-slaw.html) and fresh baked buns. *This will serve at least 10-20 people depending how much else you are serving. 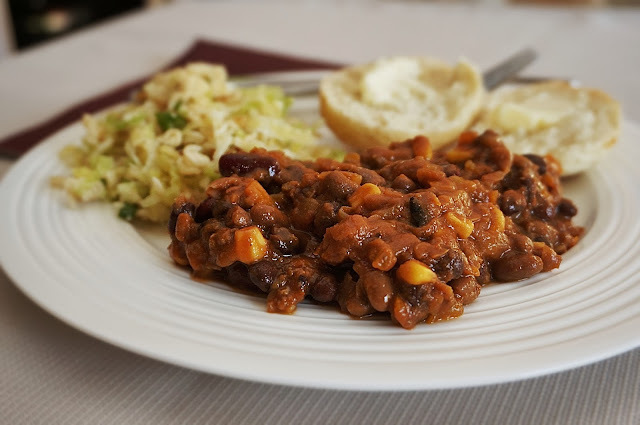 *You can increase this recipe by adding another can or two of the pork and beans. Is there an error in the recipe? Why are the pork & beans, corn and kidney and black beans repeated ? Thanks for spotting this. I've corrected it. Looks good! What do you mean by Chilli Sauce? It's a bottled sauce found near the Ketchup. I use the Heinz Chili Sauce. It also makes a great cocktail sauce if you add a bit of garlic and lemon juice. Chili sauce doesn't have horseradish in it , so need to add horseradish also, to chili sauce to make seafood sauce. Could this recipe be made in a crockpot instead of the oven? Sounds yummy. I'm sure it could. I would precook the meat before adding it to the crockpot. I made this for our Fellowship Group on Saturday night and everyone loved it. This is a keeper! Is liquid smoke an essential ingredient? Where do I find it? I buy liquid smoke in the condiment section of the grocery store. It is not essential but certainly adds that smokey BBQ flavour. It keeps a long time on the shelf.